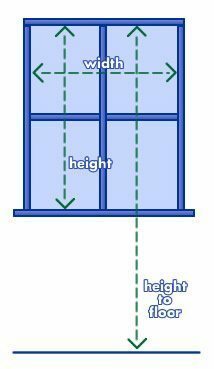 Measure the recess (inside frame) width of your window. This is shown by the horizontal arrow in the diagram to the right. We recommend you measure the width in several places and then take the shortest measurement. If there is already curtain wire or a tension rod in place, measure the width of either of these. For appropriate fullness/gather in your net curtain, we recommend multiplying your calculated width by 2.5x. The greater the fullness, the greater the privacy. Measure the recess height (top of the frame) to where you want the curtains to hang to. Again, we recommend you measure the height in several places and then take the shortest measurement. Net curtains come in standard drops with a hem made at the top for the net curtain wire or rod to pass through. To fit a curtain track or pole correctly, measure the width of the window plus 30/40cm (12-16″), this will ensure your curtains will comfortably cover your window. Fit your track or pole approximately 15cm (6″) above your window recess and centre ensuring you have 15-20cm (6-8″) either side of the window. Measure the full length of your track or pole (without its finials). For eyelet curtains, multiply your calculated width by 2. For pencil pleat curtains, multiply your calculated width by 2. For tab top curtains, multiply your calculated with 1.5. Add another 1.0″ to your total width measurement to ensure your curtains overlap in the middle when closed. Floor length, measure to 1.0″ above the floor. For eyelet curtains, write down your measurement and add 1.5″. This is the distance from the inner edge of the eyelet to the top edge of the curtain. For pencil pleat and tab top curtains, write down your measurement. Use a metal tape and measure the recess of the window at three different points, as it may not be the same along the entire recess. Measure at the top, middle and bottom and use the smallest measurements as your width guide. To measure for the length of the blind, use the metal tape and measure from the top of the recess to the windowsill at 3 different points and note the narrowest point. For vertical blinds, we recommend you reduce the length by 1cm to prevent the fabric from catching on the sill. Use a metal tape and measure across the window width, adding an extra 10cm (4″) to the total width to allow a 5cm (2″) overlap either side of the window to block out light effectively. For roller blinds add a further 5cm (2″) to the width to allow room for the operating mechanism. Decide where you want the bottom of your blind to end and measure the length of the window from the top of the fitting to this point.